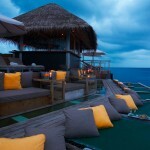 Soneva Fushi in the Baa Atoll (35 minutes by seaplane from Malé) brings you the ultimate island experience. 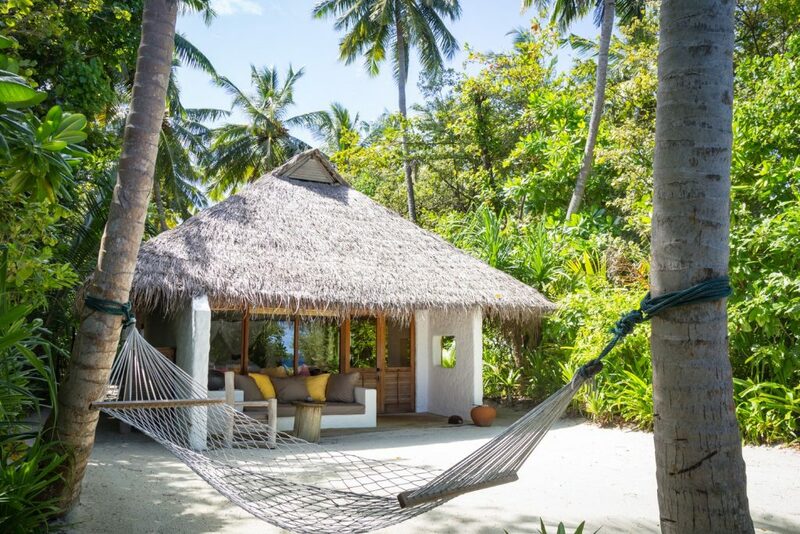 Rustic villas, a ‘barefoot policy’ and a focus on sustainable tourism makes this unique resort the ideal choice for a responsible Maldives holiday. You will feel as one with the wonderful nature surrounding you. 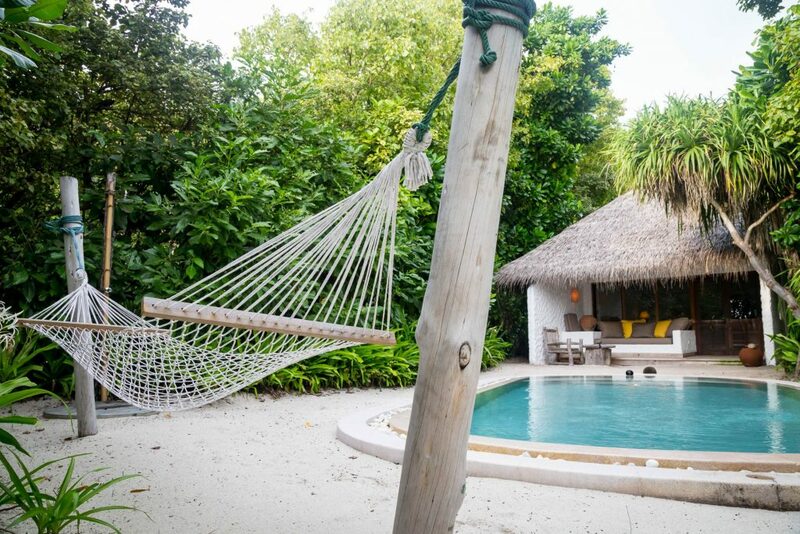 As soon as you step foot on this stunning island, you will notice that Soneva Fushi is a resort like no else. 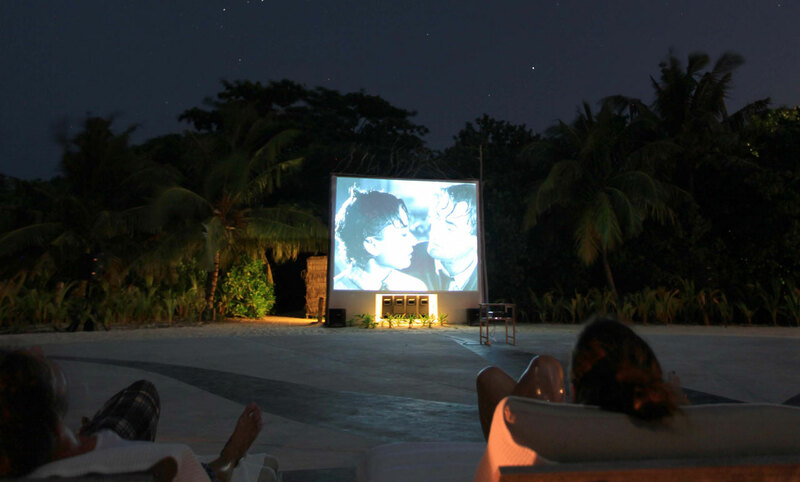 Treat yourself to spectacular tropical nature, organic cuisine, an open air cinema and star gazing in the telescope for a holiday with a difference. 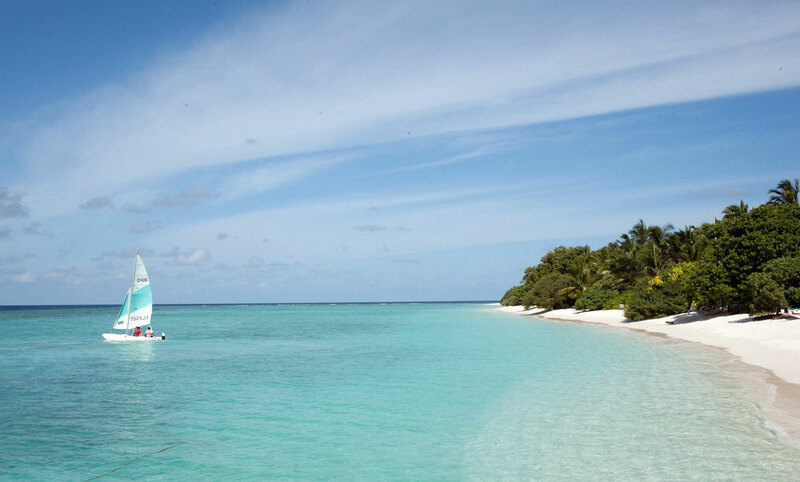 Embrace the deserted island feel and unwind completely in this sustainable Maldives paradise. 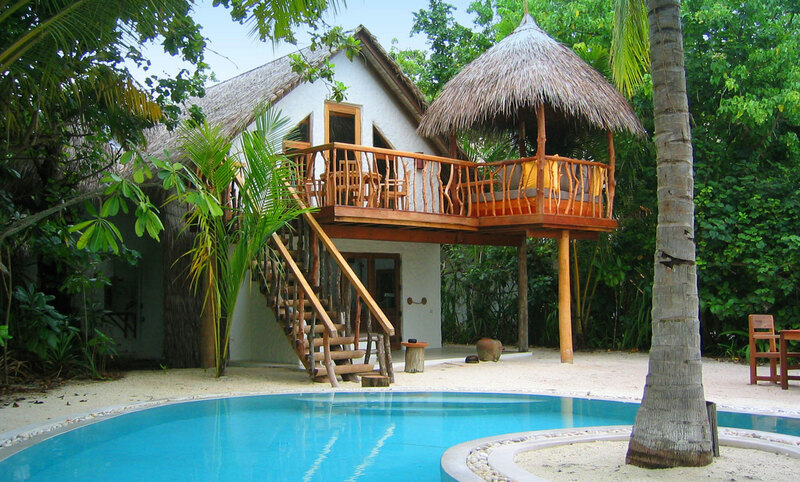 The Crusoe Villa (64 sqm) is a split level villa with an upstairs bedroom. Direct access to a lovely stretch of the beach, as well as your own private terrace and outdoor bathroom with two showers, are wonderful features of the Crusoe Villa. 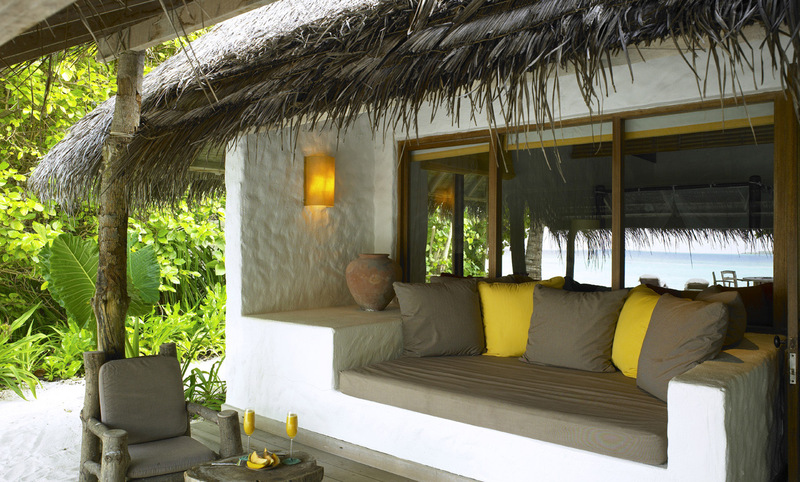 The gangway of ropes leading to the terrace adds a ‘Robinson Crusoe’ feel to your holiday. 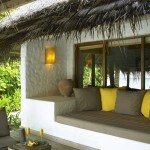 The Soneva Fushi Villa (80 sqm) is located by the gorgeous beach which it has direct access to. 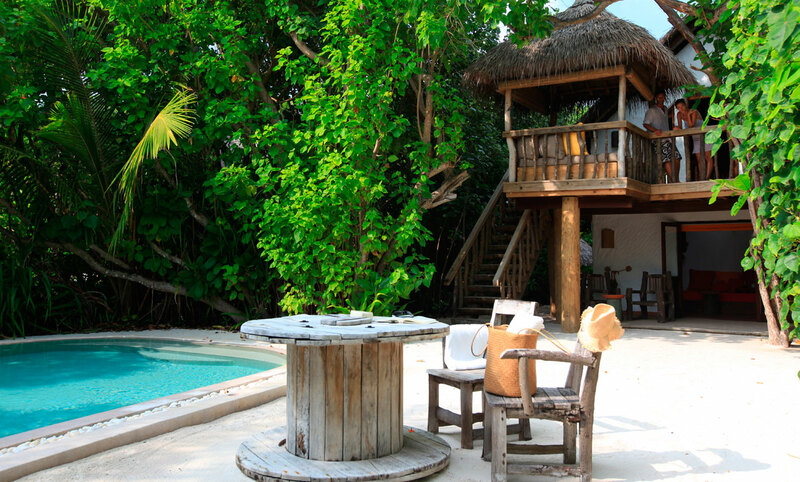 Your private outdoor bathroom is complete with a bathtub and a shower. 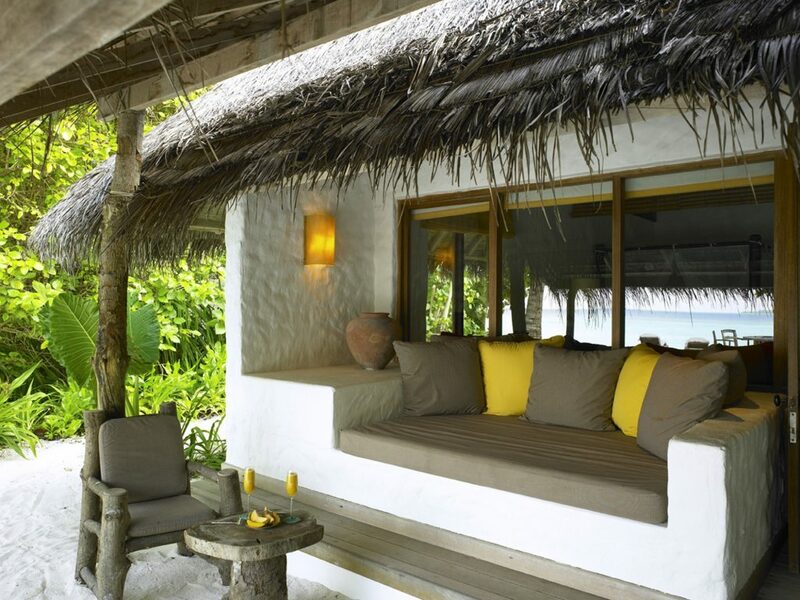 Outside your villa, you have your own outdoor space with relaxing sun loungers. 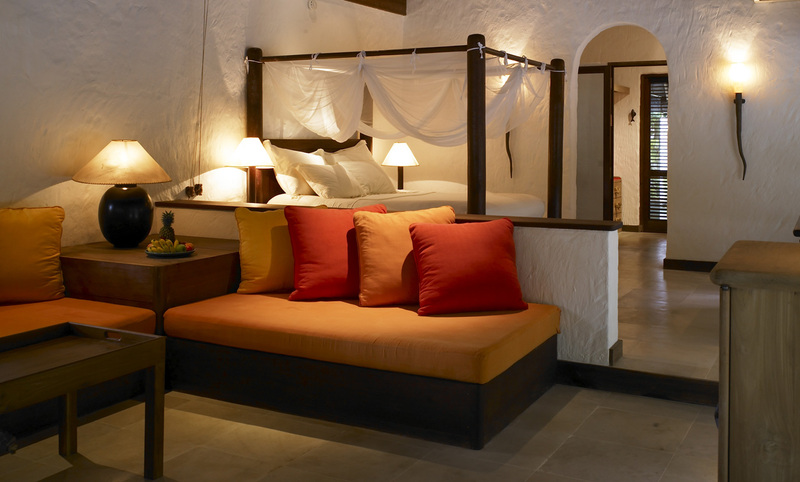 The bedroom is large and features a lovely king size bed. Bicycles are included. 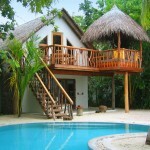 The Crusoe Villa (64 sqm) is a split level villa with an upstairs bedroom. Direct access to a lovely stretch of the beach, as well as your own private terrace and outdoor bathroom with two showers, are wonderful features of the Crusoe Villa. 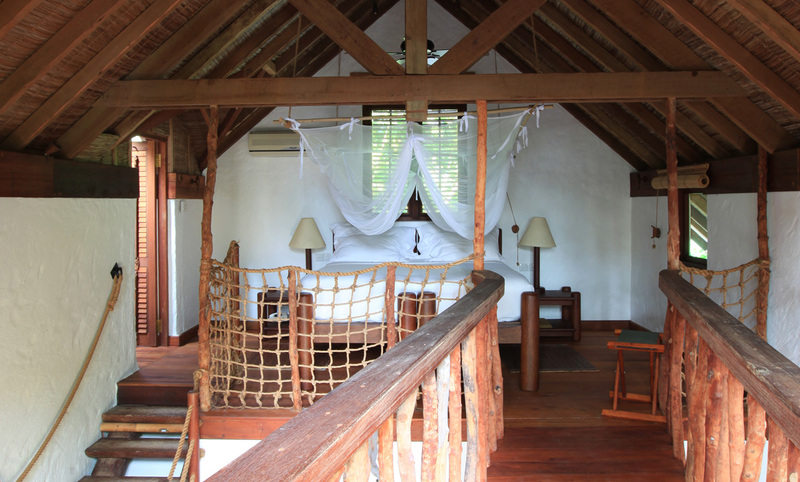 The gangway of ropes leading to the terrace adds a ‘Robinson Crusoe’ feel to your holiday. 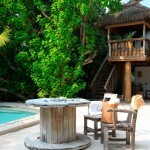 The villa also has a private pool to enjoy. 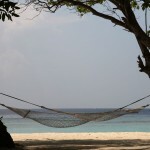 The Soneva Fushi Villa (80 sqm) is located by the gorgeous beach which it has direct access to. 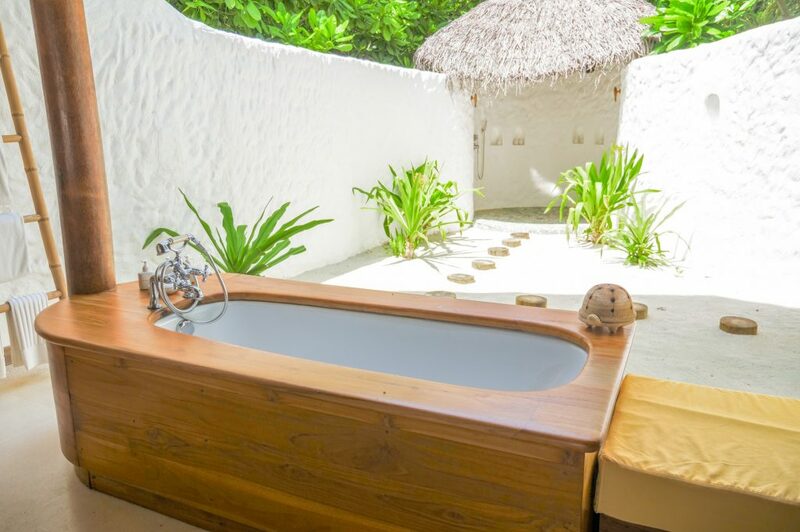 Your private outdoor bathroom is complete with a bathtub and a shower. 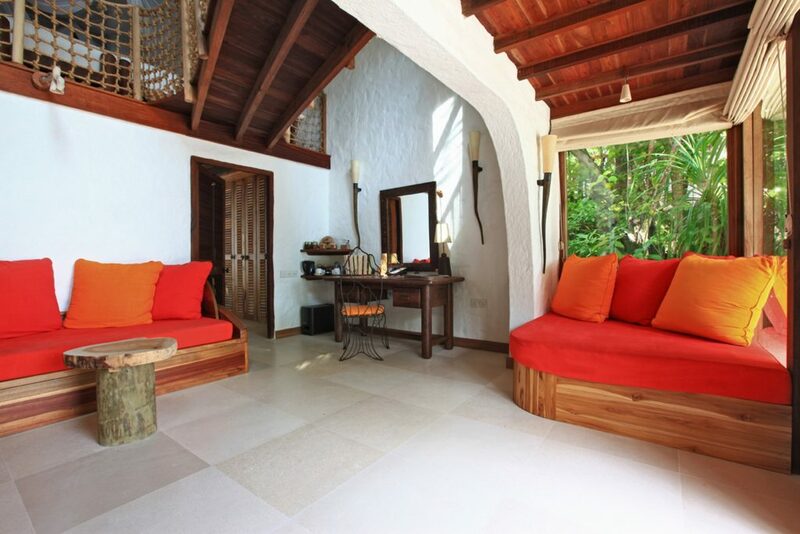 Outside your villa, you have your own outdoor space with relaxing sun loungers. 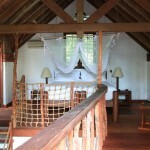 The bedroom is large and features a lovely king size bed. Bicycles are included. 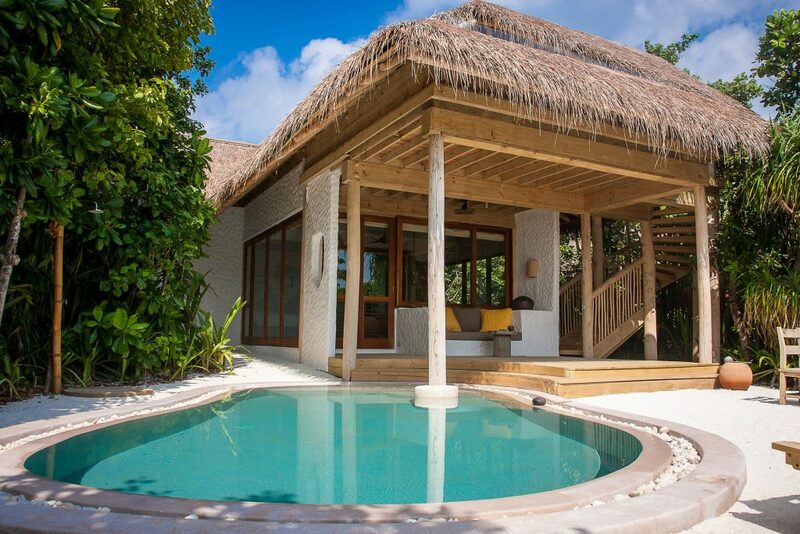 The villa also features a private pool for you to enjoy. 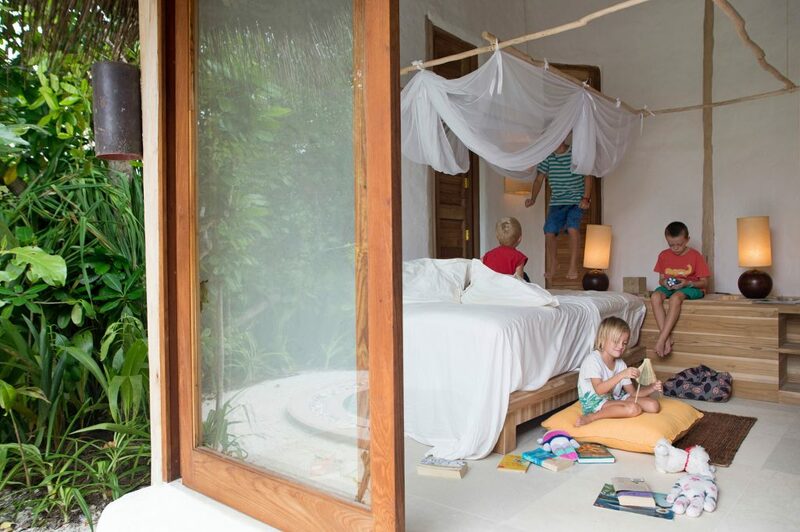 This villa was designed for couples or smaller families the villa features a separate children’s room, ideal for a single teenager or two small children. 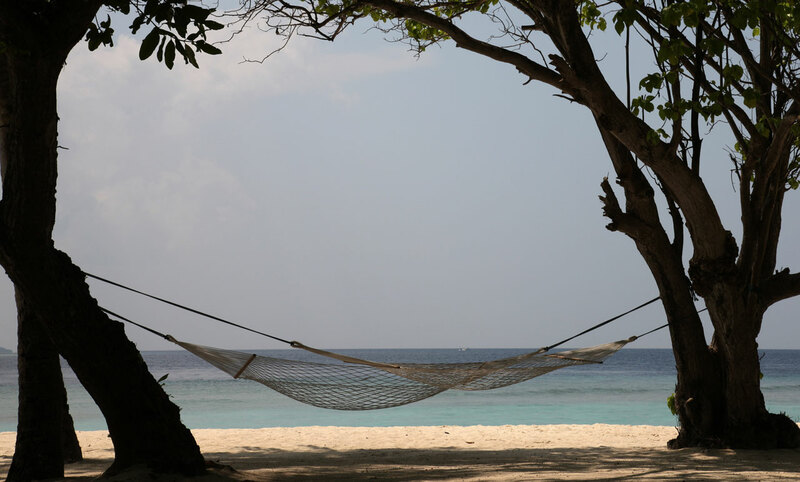 Wake up to sparkling blue water and ivory-white sand. Enjoy a coffee on the upstairs deck before catching up on your favourite book, explore the Indian Ocean or stay indoors and cosy up in the open-plan living room with floor-to-ceiling glass windows. At the end of the day indulge in your luxurious open-air garden bathroom. 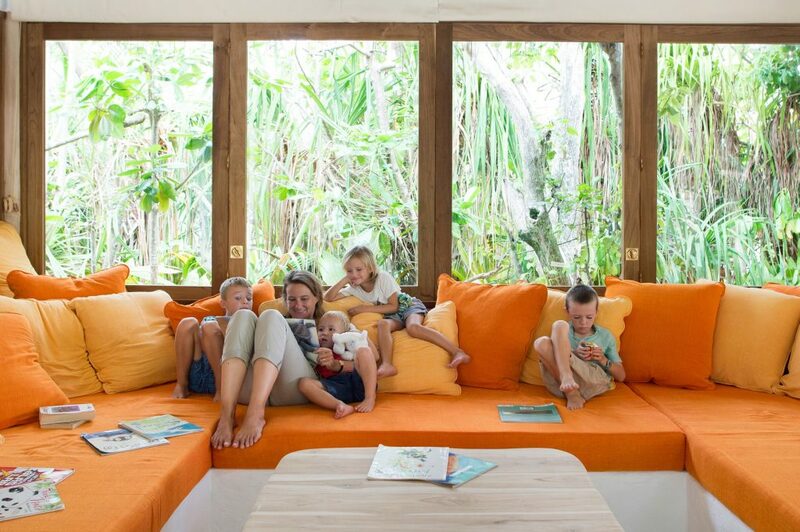 This villa was designed for couples or smaller families the villa features a separate children’s room, ideal for a single teenager or two small children. 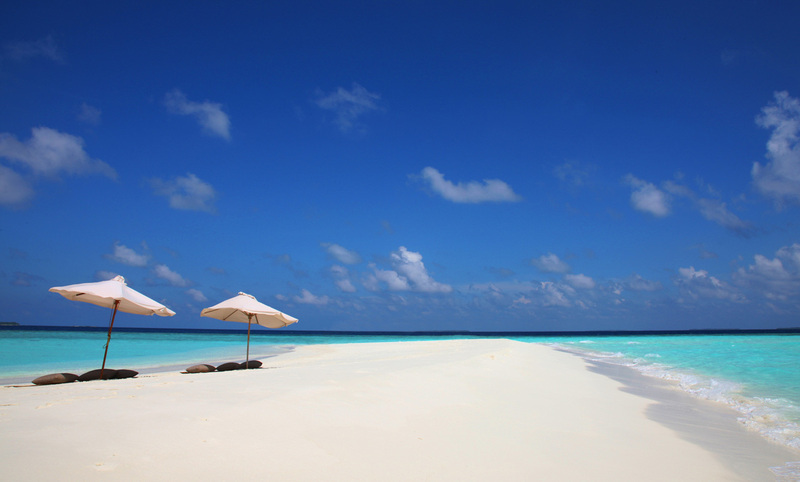 Wake up to sparkling blue water and ivory-white sand. Enjoy a coffee on the upstairs deck before catching up on your favourite book, explore the Indian Ocean or stay indoors and cosy up in the open-plan living room with floor-to-ceiling glass windows. 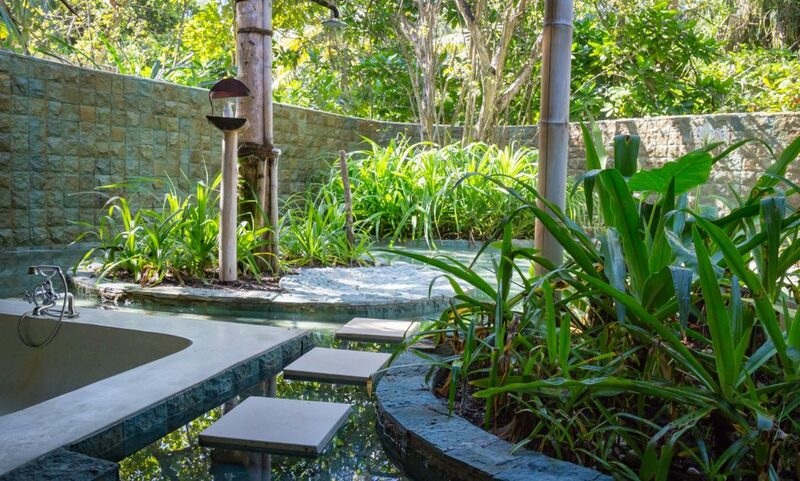 At the end of the day indulge in your luxurious open-air garden bathroom. 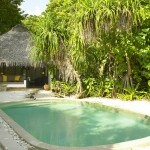 Also, enjoy the generous private pool for a midday cool off or midnight dip. 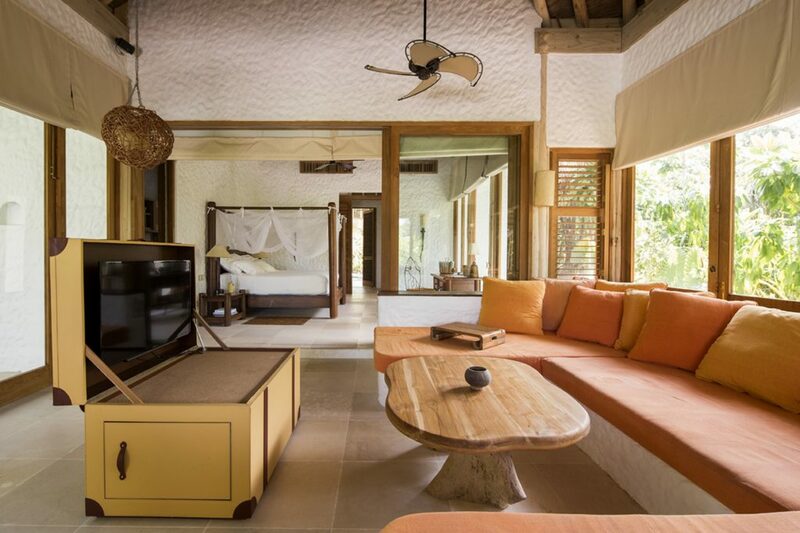 The villa also has a fully stocked pantry and a living space designed to bring the family together, whether it be cosying up on the daybeds to read a story or getting out the popcorn to watch a movie. 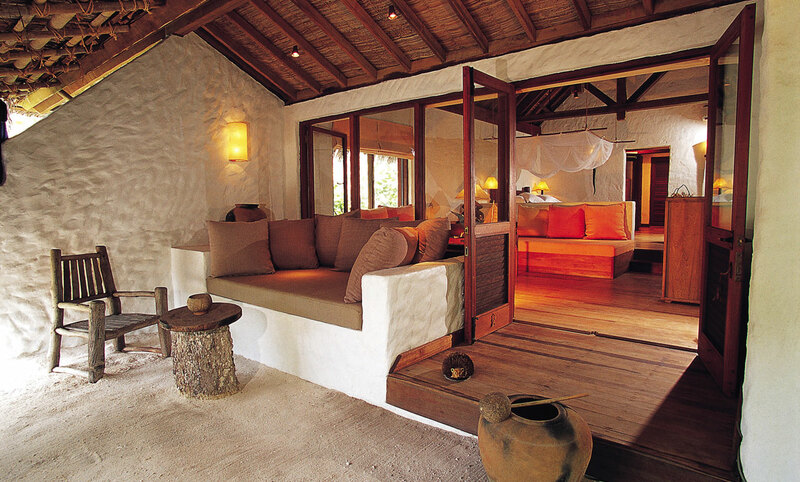 The castaway paradise of Soneva Fushi is full of little surprises to make your Maldives holiday extra special. 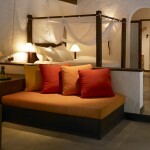 The fact that the whole resort is created with sustainability in mind lets you enjoy your stay more. 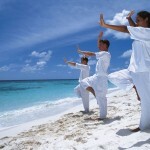 You decide if you want a holiday full of activities, or if you prefer to wind down and take the day as it comes. 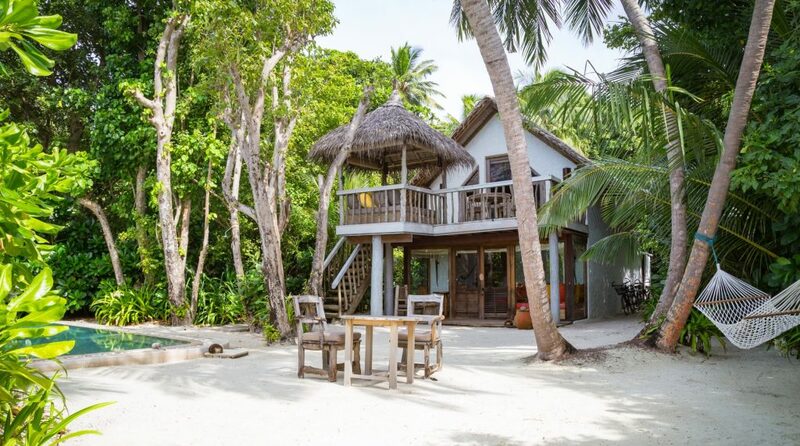 Picture perfect sand banks for a private breakfast with your loved one, snorkeling with a marine biologist, take an astronomy lesson… Your holiday at Soneva Fushi is your chance to make wonderful memories every day. The PADI Diving Centre caters for all levels of experience, meaning everyone can discover the fascinating world in the reefs. 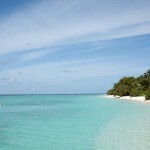 Closer to the beach, snorkeling and all kinds of water sports are available for your pleasure. How about canoeing in the morning and windsurfing in the afternoon? But if you want to stay dry, there are tennis and badminton courts for your use. 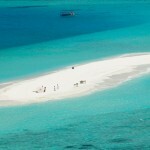 The curious guest might want to try deep sea fishing, visit stunning nearby islands or learn to cook local specialities. Whatever you do, don’t miss out on the castaway picnic on a deserted island for that ultimate Robinson Crusoe experience. 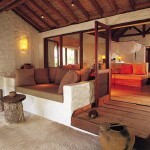 The Six Senses Spa is the jewel of Soneva Fushi. The sustainable and organic philosophy of the resort clearly reflects in the delightful treatments you will be pampered to. 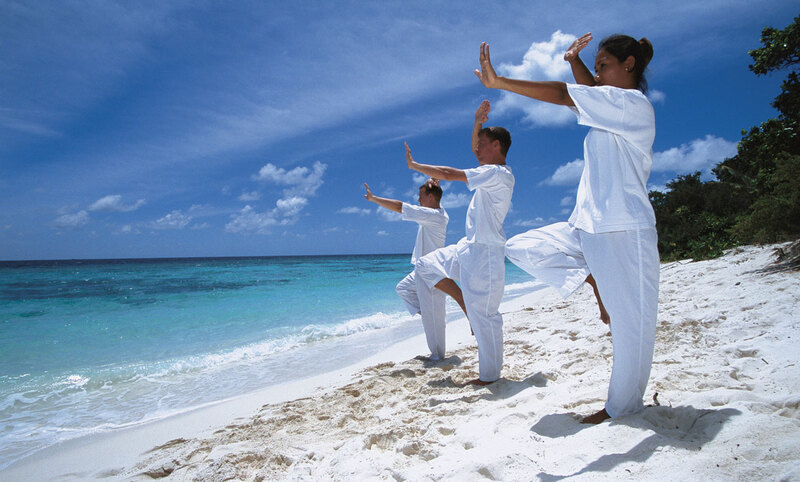 Coconut scrubs, Tibetan hot stone massages and aromatherapy will not only enhance your physical wellbeing, but also calm your mind. 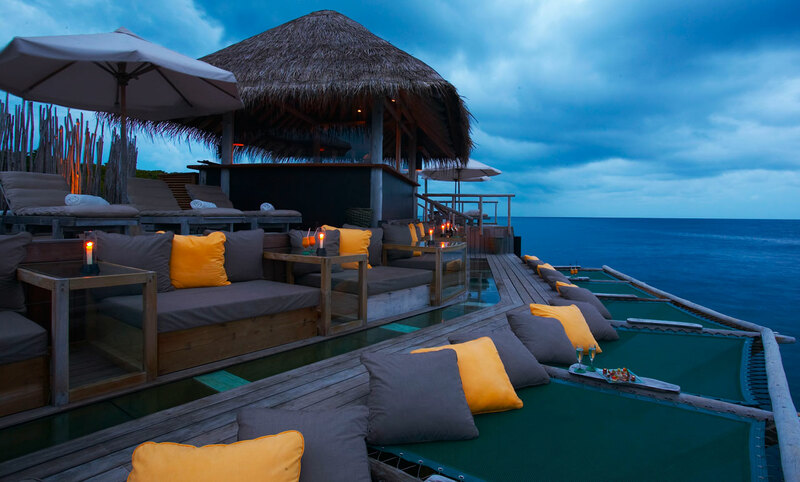 Dining at Soneva Fushi will be something you’ve never experienced before. The culinary delicacies you are treated to are based on island grown produce and freshly caught fish, ensuring the sustainability of the island. 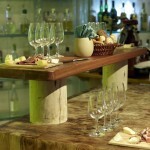 Every day provides opportunities for unique dining experiences. 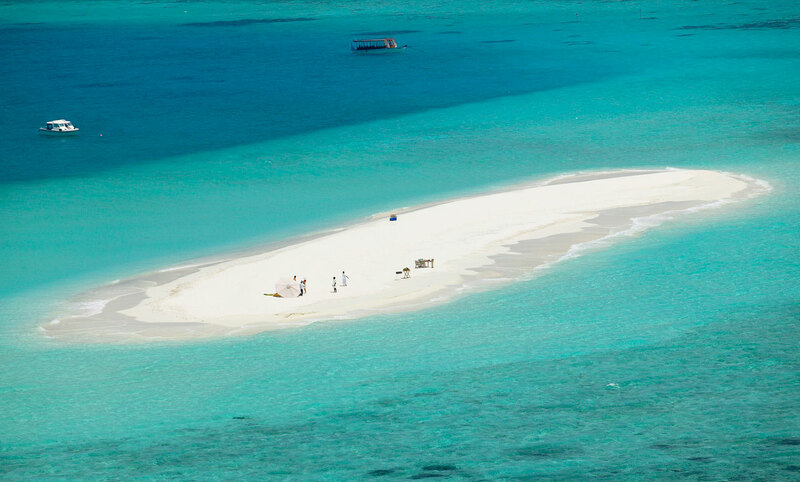 How about breakfast on a secluded sandbank, followed by dinner on a deserted island? 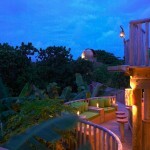 It’s also possible to dine in the seclusion of your own villa. Down to Earth located close to the jetty offers Mediterranean cuisine to share and stands out from the other restaurants. Mihiree Mitha is where you will enjoy food from all over the world. 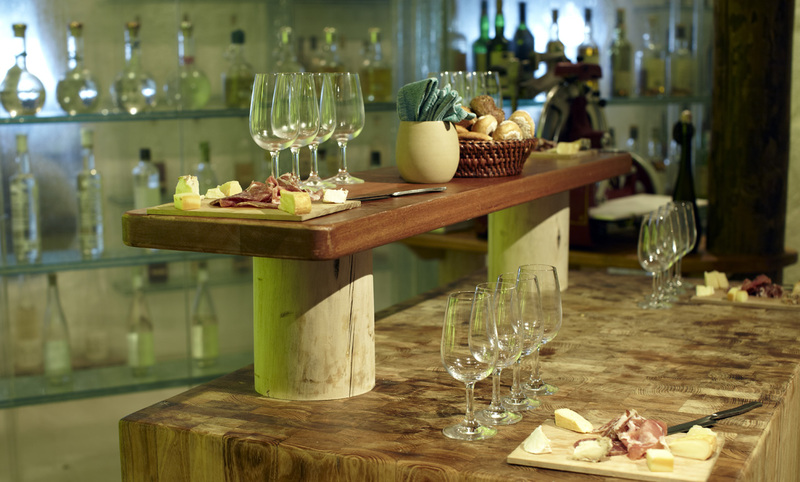 Tantalizing breakfasts, organic salads, wood fired pizzas and homemade sorbets are only a few of the delicacies from the menu. So Spiritual Bar is the relaxing main bar of the resort, offering exotic cocktails and spirits. 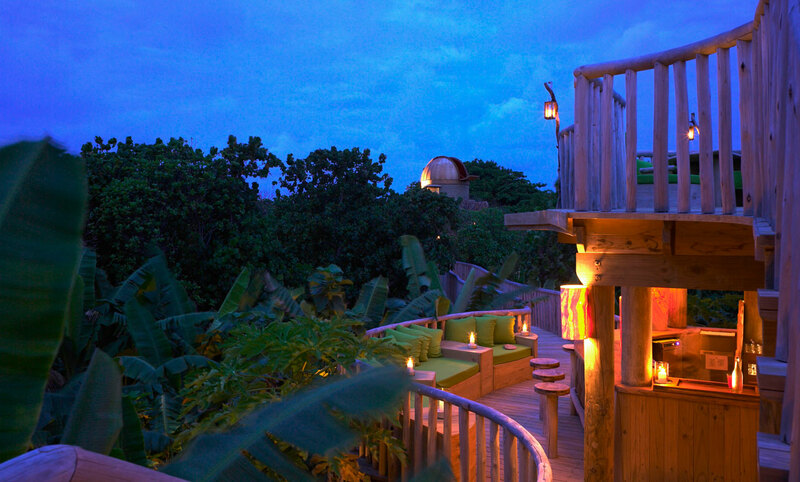 By the Beach lets you enjoy a candlelit dinner with sand between your toes. Enjoy freshly caught seafood accompanied by a starry sky and the soothing sound of the waves. Fresh in the Garden only uses ingredients grown on the island, making for a 100 % carbon neutral meal. The panorama views of the island makes the perfect backdrop to your dining experience in this unique restaurant in the northern part of the island. 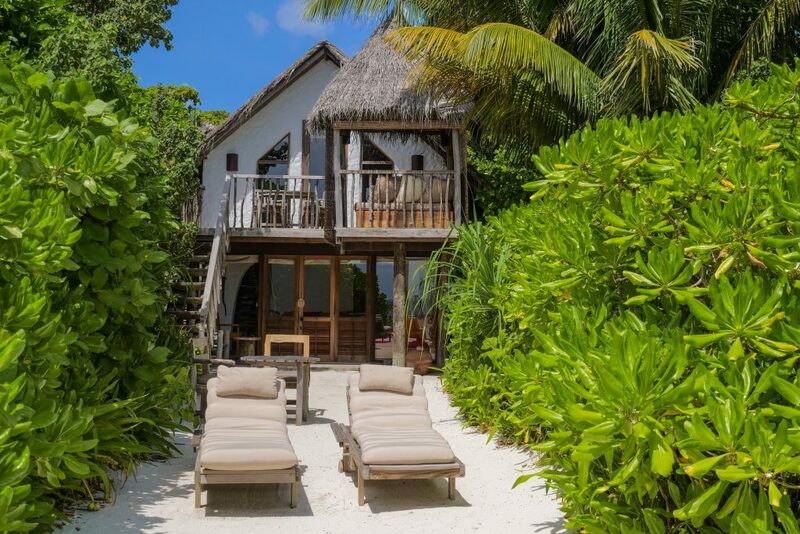 Simply Maldives Holidays offer a Bed and Breakfast option, Half Board Package and a Full Board Package to guests staying at Soneva Fushi. 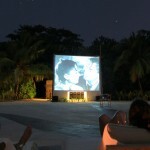 enjoy a complimentary bottle of champagne, a complimentary wedding cake, plus a Soneva photo frame and departure gift.